Are you in need of garbage disposal repair? A garbage disposal or food waste disposer and waste disposal unit as they are often referred is a device, usually electrically-powered, installed under a kitchen sink between the sink's drain and the trap which shreds food waste into pieces small enough to pass through your home's plumbing system. Because this involves a mechanical piece of equipment and is ultimately tied to your sanitary sewer or septic tank system, plumbing problems may occur. 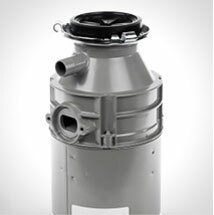 At present, some forty-seven percent of the homes in the United States utilize a garbage disposal. Restart disposer by turning on power switch. Should you experience a garbage disposal that doesn't work, you can contact Benjamin Franklin Plumbing, where our plumbers are expert in the repair, installation and maintenance of garbage disposals. Contact us if neither of the two options mentioned alleviate your garbage disposal problems.